Mr. Lumet, are you missing something? Um, Mr. Lumet, this is awkward, but it seems an alert Greenpointer found a little something that might belong to you. Maybe you were on the intersection of Calyer, Banker and Franklin recently? A woman named Rebecca found a trophy in the bushes there. It reads: "Lifetime Acheivement Award, For Outstanding Contribution and Dedication to the Art of Filmmaking." Then, very large, "Sidney Lumet." That would be you. 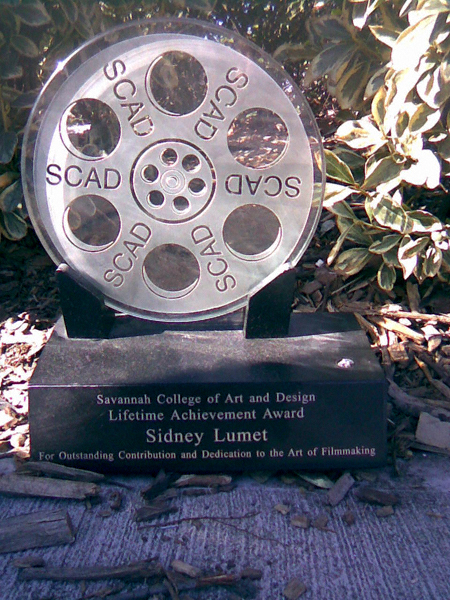 The honor was bestowed by Savannah College of Arts and Design. Maybe you remember being at their film festival and getting the award back in October? Maybe this happens all the time out in L.A., but here in Brooklyn it just seems a bit out of the ordinary. So anyway, if you are looking for a trophy (it looks like this) get in touch with Rebecca, who'll be happy to return it. Maybe lifetime achievements just aren't worth what they used to be. Such are the consequences of unchecked inflation.